You may remember that a while back I posted an article where I discussed the options I considered for a media player. 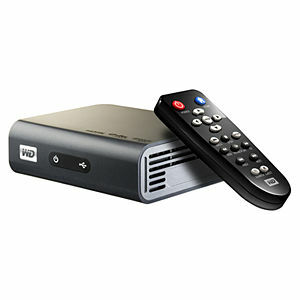 I looked at a lot of possibilities and in the end I decided to purchase the Western Digital WD TV Live HD Media Player. I have had the device for several months now so I thought it was time for a review. The WD TV Live is a device which is a little smaller than a desktop hard-drive. The retail box contains the device itself, a small and very simple remote control, batteries for the remote, an AC adapter, a special component video cable, a special analog stereo cable, and an installation guide. In case you are not sure what this device and others like it do, the concept is pretty simple. These media players have several inputs which allow you to read files on your computer, network, or a portable storage device, the software (codecs) required to read/play them properly, a small operating system to allow you to navigate and consume your media, and the outputs necessary to send the audio and video to a Home Theater system or directly to a TV. Input-wise the WD TV Live covers the basics. It has two USB 2.0 inputs to plug in external hard drives or USB drives and an RJ-45 network jack to allow you to connect the device to a network router. It does not have on-board WIFI but one of the USB connections could be used to plug in a Wireless USB Adapter (not included). As far as outputs go, this device is pretty well equipped. 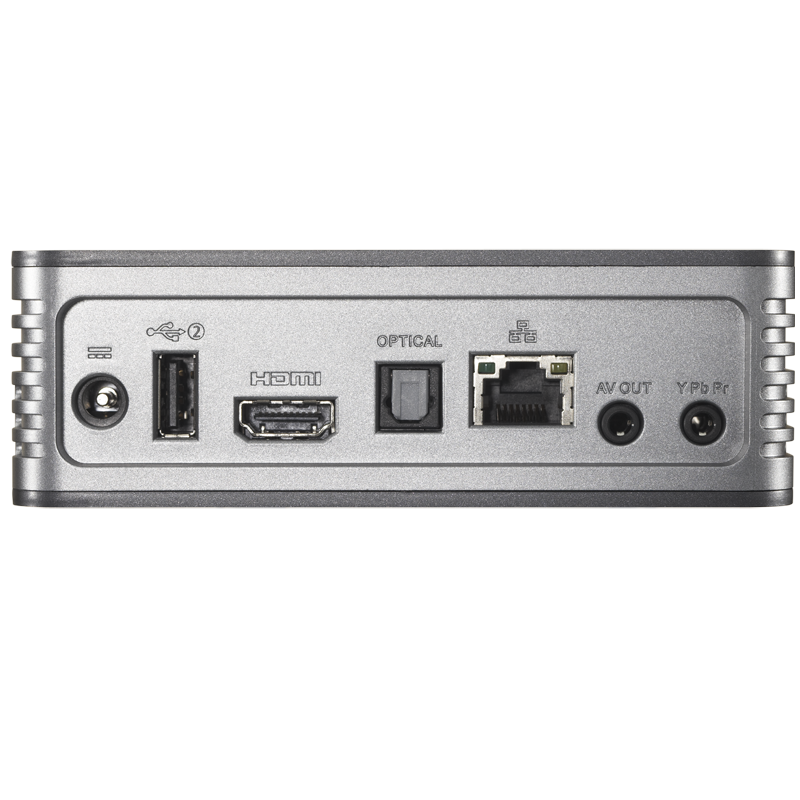 For digital outputs, it has one HDMI (audio and video) and one Optical audio. Analog outputs include one Component video and one Composite audio/video connection. The device is capable of producing 1080P video and digital surround sound. Unfortunately the analog options are hampered by the fact that they require special cables to work with the mini connectors on the back of the device. Western Digital includes the necessary analog cables in the box, but they use the cheapest cables I think I have ever seen. One of the connections on the Component cable that came with my unit broke – that is the first time that has ever happened to me with any audio / video cable. I tried another Component cable that should have worked but it did not. I am left wondering if I have to buy a replacement from Western Digital – ungood. Western Digital indicates this device plays menus from DVD images, but my experience is that DVD playback capabilities on this device are weak. You can play a DVD, but it is a bit cumbersome and seems to be hit and miss. The operating system included with the WD TV Live is solid but not particularly exciting. It provides all of the functions you would expect, and a few you might not expect. The settings menu allows the user to setup the network connectivity for the unit, define the behaviour when using the various functions, and modify the overall settings for the unit. The system setting option is where firmware updates for the device can be found. Western Digital makes the firmware update process pretty seamless, and I have never had a problem updating my device. Updates are provided on a fairly regular basis. The video, photo, and music options allow the user to browse to their media and play it very easily. There are plenty of settings to define how transitions between media will be handled, along with other behavior. One feature I like is the ability to play music via the WD TV Live while browsing photos on the device. It seems like a simple feature but it easily could have been overlooked in a barebones operating system like this one. Accuweather.com – Provides a snapshot of the current weather and the 5 day forecast. This feature works in Canada. Deezer – Provides audio streaming services for music. Some of the features work in Canada, but I have not signed up for an account so I can’t confirm that they all work. Facebook – This service is OK for viewing, but typing with a remote control is as painful as it sounds. Flickr – Photo site. This service works in Canada. Flingo – Offers free video streaming including what seems to be some copyrighted material from various providers. This service works in Canada. LIVE365.com – Offers audio streaming services. Seems to be a paid service only. I don’t know if it works in Canada. MediaFly – Another service offering free video streaming including what seems to be some copyrighted material from various providers. This service works in Canada. Pandora – Internet Radio. This service is available in the US only. The WD TV Live is the oldest of three media players currently being offered in the WD TV family. The Western Digital WD WDTV Live Plus HD 1080P Media Player is almost identical to the WD TV Live except it offers NetFlix and Blockbuster On Demand capabilities IN THE US ONLY. I am disappointed with WD TV in this regard. Sony, Microsoft, and others have figured out how to support Netflix in Canada on their devices, but for some reason Western Digital is unwilling or unable to figure out how to do the same. The most maddening thing is that Western Digital is selling the Live Plus in Canada for more than the Live even though it’s only differentiating features do not work here. I think they should either make those features work here or not offer the Live Plus in this market. The Western Digital WD TV Live Hub HD Media Center is the newest offering in the family. It offers a new user interface, standard AV jacks, a better remote, and on-board storage in the form of a 1TB hard drive. It also offers the US only NetFlix and Blockbuster services, but unlike the Live Plus, this device is different enough from the Live without those features to justify it’s existence in Canada. If I was buying a WD TV device right now, this is probably the one I would buy. All in all I am pretty happy with my WD TV Live, but it is not perfect. The frequent updates to their operating systems and extensive format support are likely the two things that are most responsible for making Western Digital a leader in this market. I have no problem recommending these products to my friends, as long as they are aware of the limitations. As you know, I own a WDTV Live Plus purchased with the personal one on one help of the Value Canuck himself. I am very pleased with this purchase so far. I have downloaded movies and TV shows with no problem…oh yeah except for the time I downloaded the last episode of Dexter and I got an e-mail from my ISP telling me to stop doing this. Since then, I have slowed down my download activity. On the subject of download activity, my ISP also has a limit to how much I can download in a month (60 GBs) and in the first month, I came very close to that limit which would have resulted in a $2 fee for each gigabyte over the 60. It does work great for viewing pictures and video and YouTube works well too. Thanks for the help Mr. Canuck or can I call you Value?